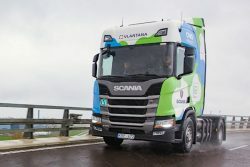 Scania in Lithuania has partnered with the Vlantana logistics company and SG dujos, developer of gas infrastructure, to trial the first gas-fuelled truck in the country. The Scania R 410 with its 13-litre gas engine is being trialled on local and regional routes. Fuelling CNG in Lithuania is currently more than 40 percent cheaper in comparison with diesel. Lithuania already has nine CNG filling station trucks with services available in all major cities. The CNG trials are seen as a forerunner to coming availability also of LNG, with the first LNG filling station due to open next year. With Lithuania’s floating LNG storage and regasification unit Independence, docked at Klaipeda since 2014, a rapid expansion of LNG facilities is expected. “Gas is becoming a perfect alternative for all transport operators, not only because of the environmental aspects but also because of the competitive price”, says Virginijus Korsakas, CEO of SG dujos.